Another week “hacking through the brush” at work was interrupted when a co-worker and friend Nicki stopped by to share the joy of her new baby boy and the delight of a proud spitfire sister in tow. The staff gathered around to soak it in. During the visit, she handed me a bag with my birthday gift. I put it in my office, rushed around a bit more and then finally sat down for a moment to open it. 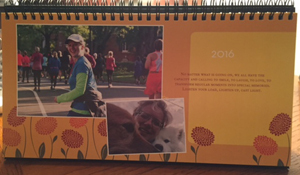 She created a beautiful custom calendar with photos from the Cast Light blog and my quotes throughout. I sat quietly and my eyes welled up, instantly my “hacking” moved to “hawk-like spirit,” brought back to what matters, to what we know. A true friend knows us and they hold up a mirror that only shows our best selves. Lately, I’ve been on auto-pilot of getting things done as quickly as possible because the “list” keeps growing. But we can never go fast enough for what the world throws at us and what we so readily accept as necessity. However, we can choose a different path, a different way. The gift that she gave was much more than the calendar and the visit, which was plenty. It was a much needed reminder to slow down, enjoy each day and be ever so grateful. She generously shared her joy and delight, that glow that comes when you realize all of the blessings that are already present to us. And we can give that gift to one another as we see someone struggling, hacking. We can pull each other to our spirit, our purpose. The gift is now. Accept it and give it away. “A true friend knows us and they hold up a mirror that only shows our best selves'” – Love this line and it is so true. Nice post, nice friend. Happy birthday.